Early developmental stages of Megasphaera. Xiao et al. 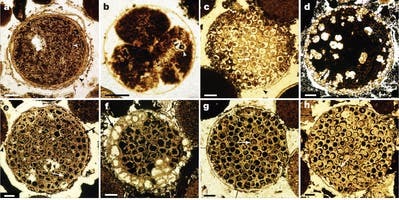 Some bizarre spherical fossils found in China may be remnants of some of the world’s earliest animals (not unicellular organisms). A recent analysis has revealed that they are not bacteria or single celled protists, but rather algae, or even embryos from early animals. The cells have been dated to 600 million years. How this dating technique works is that they don’t date the fossils directly, but the formation in which they were found (the Doushantuo Formation). The fossils are known as Megasphaera and measure a mere 0.03 inches (0.7 millimeters) across. They lived in what was likely a shallow marine environment. At the first examination, researchers believed they were dealing with some bacteria formations, but further investigations revealed that it was something else. They look just like what you’d expect from an undeveloped embryo, but the problem is that no animal which could have produced the embryos was ever found in that time period. The only other plausible alternative would be algae. In order to reach these conclusions, paleontologists sliced thin sections of the formation – so thing that light passes through them. Using microscopy, they observed several cells, cramped together in spherical clusters. The cells were different from one another in shape and size, which means that they were developing different tissues — a process known as cell differentiation — presumably with different cellular functions, Xiao said. This is a clear sign of a multicellular organism. “That is a telling sign of the complexity of multicellular organisms that you don’t find in bacteria or protists,” he said. The question which then arises is: are the fossils animal, or plant? The study seems to indicate signs of an animal. However, it seems clear that the cells represent a transition stage from unicellular organisms, to multicellular organisms – and this transition is believed to have occurred initially in plants, not in animals. Furthermore, if these are the embryos… then where are the adults? The only way to settle these questions is finding more specimens and determine a pattern.